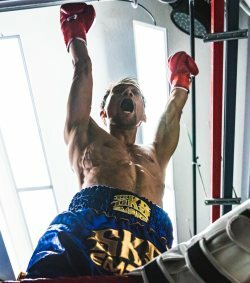 SINGAPORE, 20th March 2019 – The race to become Singapore’s top super welterweight boxer is on as the top two boxers in the division – France’s Abdelelah Karroum (1st) and Singapore’s Alexandrew David (2nd) – will match up against one another at the sixth edition of The Ring Fighting Championship (TRFC). Happening at The Ring Boxing Community on 12th April 2019, the main event of the night will see both boxers attempt to break the other’s unbeaten fight streak as Karroum (4-0-0) and David (4-0-1) battle it out for the World Boxing Council (WBC) Asia Silver title. Since turning professional in early 2018, Karroum has put up impressive performances in the boxing ring – securing four victories, of which all four were knockouts. This will be the 26-year-old’s sternest test to date, as this will be the first time he will match up against an unbeaten opponent in David. Like Karroum, David has put up top displays since turning professional three years ago. Despite not earning a win in his last boxing bout, the 27-year-old impressed against the hard-hitting Malaysian Keng Fai Hui – whose past four victories prior to facing David were all knockouts – to earn a draw. The co-main event of the night will see Singapore’s Hamzah Farouk attempt to extend his seven-fight winning streak when he defends his WBC Asia Continental Super Featherweight title against experienced Thai boxer Paiboon Lorkham, who has 30 fights under his belt. Big things are in store for former Mixed Martial Arts (MMA) Atomweight Champion Kirstie Gannaway following her professional boxing debut win late last year at The Ring Fighting Championship V. With a detailed plan and dedicated team behind her, Gannway will look to challenge for a regional title towards the end of the year, but next up for Gannaway is a match up against Indonesia’s Nadya Nakhoir. It’s clear the sky’s the limit for The Ring Fighting Championship as they once again aim to deliver more top-notch fights for boxing fans, with TRFC VI being their biggest event to date. There will be a total of 13 fights happening throughout the night – eight professional fights and five amateur boxing bouts, where all five bouts will be TRFC Amateur title fights. Beyond looking to constantly deliver quality boxing events in Singapore, Ruchdi Hajjar, the founder of Golden Glove Asia Promotions (GGAP) and owner of The Ring Boxing Community, is committed to building up the calibre of boxers in Singapore, with 13 Singaporean fighters featuring on TRFC VI’s card. TRFC is sanctioned by the Singapore Amateur Boxing Association and the Asian Boxing Council.